G.I. 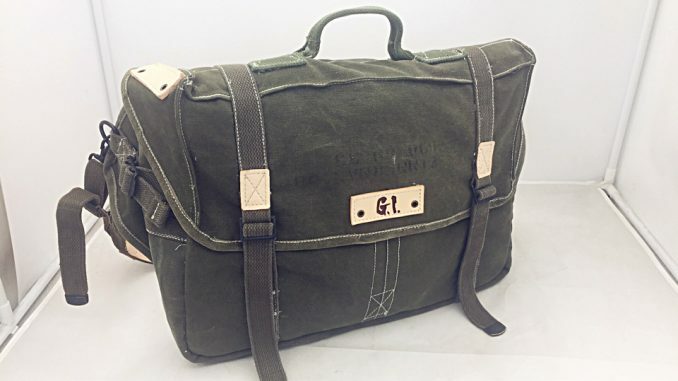 Original designed messenger bag，named as ‘Classic 1945’. It was inspired by the M-1945 Field Pack System which used during the late WWII and Korean War. We focused on retaining the original G.I. design style and appearance characteristics of its own era. Practicality is also one of the element we were thing of. All canvas fabrics, webbing and metal parts are taken from the original US issued field equipment. The straps are made from original M-1945 Suspenders in two form: normal two-point sling and three-point strap w/ retaining branch strap. To prevent the canvas from coloring users’ cloth, the body side is lined with leather.